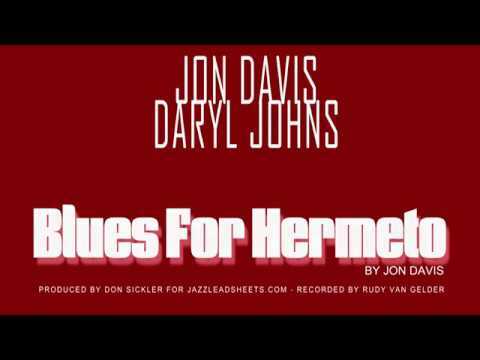 Jon Davis' tribute to Brazilian composer and instrumentalist Hermeto Pascoal is a melodically simple, quirky blues variant in 7/4. Its only recording is a duo setting with bassist Daryl Johns. Jon Davis and Daryl Johns perform BLUES FOR HERMETO at the Van Gelder Recording Studio, August 24, 2011. With this song, Jon Davis brings his distinctive melodic and harmonic vocabulary into 7/4 meter. This 7/4 is felt as 4 + 3 throughout. This song has a 12-measure form; it is certainly a blues variant, but does not go to the IV and V tonalities at the expected points. Instead, they arrive one measure early: Asus on the fourth measure, and B9♯5 on the eighth. The seventh and eleventh measures go to B♭ major chords, sort of a tritone substitute tonic; each are preceded by two measures with shifting triads over stepwise roots. The melody is quite simple, staying on E minor pentatonic almost throughout, with C♯ added, unexpectedly, over the B♭ major chords. The melody's structure is the reverse of many blues heads, with the second and third 4-measure phrases being nearly identical (a sort of ABB form). As with many Jon Davis compositions, a vamp is used for the intro and ending. This vamp moves stepwise between E and G chords, as does the beginning of the head. Our audio clip above starts with the melody; see the video performance for the intro vamp. The vamp is notated on the lead sheets (minus improvisation). A duo transcription is available which includes a melody transcription for both the in and out heads. On the recording, the head is played once in but twice out. Bass notes are shown on the intro, and bass rhythms for the in head. A basic piano part is shown in the transcription for what Jon plays behind the bass solo, as well as the ending vamp which also features a bass solo. See all Davis/Johns piano/bass duos here. "I don't know his music tremendously. Whenever I've heard it I've found it pretty remarkable. Blues For Hermeto was directly a result of listening to a cassette I had of Hermeto playing this cool stuff in seven. It had been a little abstract-sounding to me years earlier. Then I heard it again, and I said, this is amazing stuff. I've got to try to write something like this. And that tune just happened within hours. This is the only tune I've written in seven."